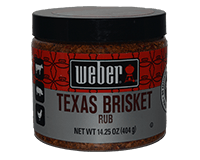 Weber Texas Brisket Rub will add a little heat to your grilled meats with this unique sweet and smoky flavoring. Perfect for steak, chicken, and pork. Rub approximately 2 tablespoons of Weber Texas Brisket Rub per pound of pork, chcken, and beef. Make sure to wait approximately 5 mins after putting rub on before cooking. Ingredients: Salt, Dried Onion, Sugar, Dried Garlic, Spices, Chili Pepper, Natural Mesquite Smoke Flavoring, Extractives of Paprika (color).